I just walked in the door from a class at Wholly Scrap (hi girls!!) and sat down to check my email. A few emails down and I came across my Google Alerts email (an email that let's you know where your blog has been mentioned) and right on the top was Nichole Heady's blog. Um...hello....why was I mentioned on Nichole's blog? 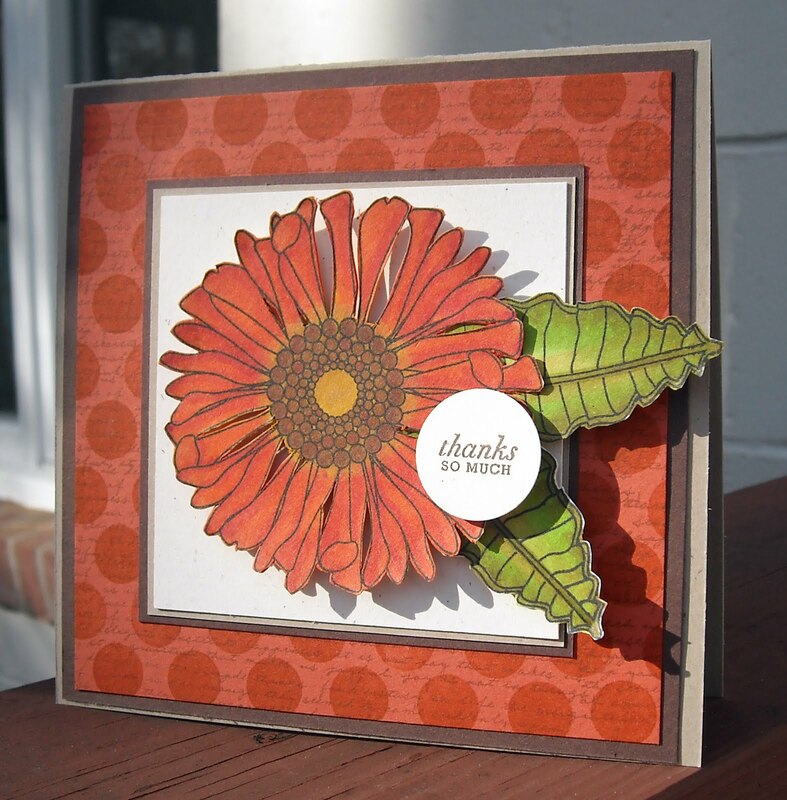 Girlfriends...I have died and gone to stamping heaven...My card, my little flower card (shown here), won the "Best Use of a Previously Released PTI set!!!" I can't believe it...simply can not believe it! I jumped out of my seat and yelled when I saw the post. LOL! Thank you Nichole, you just made my night...and my week...and my month...you get the picture!! You can check out the post for details on the stamp sets used and to see all the other beautiful work!! My sweetie friend Julie got an honorable mention too!! Yeah!! Thanks for letting me share...I'm so shocked I won and oh so excited!! It's time for another SALT challenge! This week it was Stacy's turn to pick the challenge and she picked a verse from Romans, “This is also why you pay taxes, for the authorities are God's servants, who give their full time to governing. Give everyone what you owe him: If you owe taxes, pay taxes; if revenue, then revenue; if respect, then respect; if honor, then honor." She also has a great write up on honor and respect on the SALT blog. I chose to work with a portion of Romans 13:1, "let every soul be subject..." This section of Romans (vs. 1-7) focuses on Christians and civil government. Although this might seem like a difficult challenge, we know that all Scripture is given for our benefit so what can we glean from this portion? I'm going to take the easy way out and share some notes from my study Bible: Civil government is a means ordained by God for ruling and maintaining order in communities. It is one of a number of such means, including ministers in the church and parents in the home. Each such means has its own sphere of authority under Christ and the limits of each sphere are set by reference to the others. In our fallen world these authorities are institutions of God's kindly providence, standing as a bulwark against anarchy and the dissolution of ordered society. Because civil government exists for the welfare of the whole society, God gives it the "power of the sword," the lawful use of force to administer just laws. Christians must acknowledge this as part of God's order. However, if it forbids what God requires or requires what God forbids, Christians cannot submit, and some form of civil disobedience becomes inescapable. (For example, if government forbids the worship of God. As a Christian, we would be compelled to "disobey" this government imposed law, since this would be an overstepping of their God-given role in society). Christians should urge governments to fulfill their proper role. They are to pray for, obey, and yet watch over civil governments reminding them that God ordained them to rule, protect, and keep order. The verse I used is a reminder that every soul is subject to God, no matter how powerful their position. The second part of vs. 1 states that "there is no authority except from God, and the authorities that exist are appointed by God." If anyone in authority abuses their power or those under them they risk judgement from the same God that appointed them to their position. That judgement may not come in this lifetime but it will most certainly come in the next. "...for it is written, Vengeance is Mine, I will repay, says the Lord." This is a serious warning and should give everyone with authority over others a reason to soberly consider their own actions. God will hold that person accountable, not just for how they ruled, but also for how they treated those under them. Likewise, we may not always be happy about certain ruling authorities, however, we are still required to pray for them, and to show them respect, trusting that God is in control. "The eyes of the Lord are in every place, keeping watch on the evil and the good." -Proverbs 15:3 For my ATC, I decided to channel Tim Holtz because...well....I love Tim Holtz...*smile* The idea for today's art was taken from his new book. 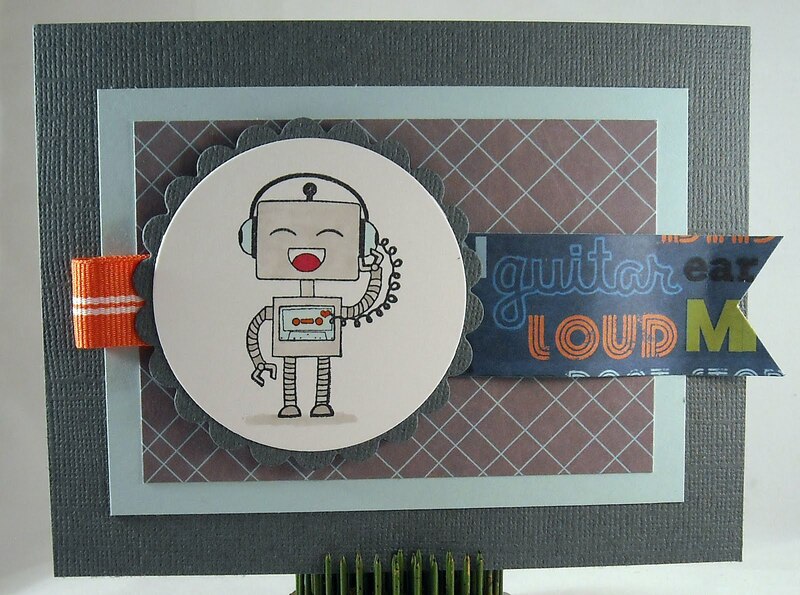 I used a number of his new sets, along with a grunge paper swirl, cut using one of his new dies. (Yes, I've been doing just a bit of shopping at Wholly Scrap!!) 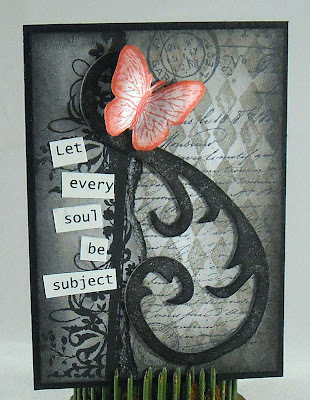 The sweet little butterfly is from a Gina K stamp set, A Beautiful Life. Be sure to stop by the SALT blog to check out the amazing work posted by our design team...they outdid themselves this week!! And don't forget that if you're inspired to create something based on this week's theme, that you can leave us a comment with a link back to your blog or gallery. We'd love to see what you come up with! Enjoy! 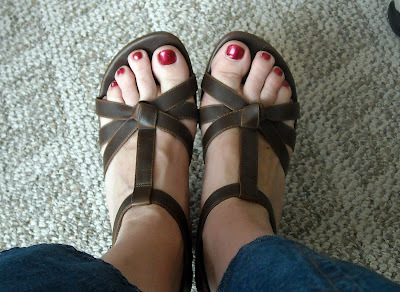 My fabulous shoes! LOL! 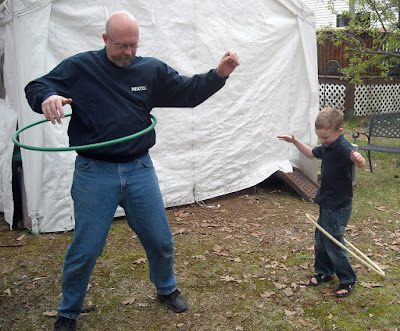 These are one of my favorite pair of sandals...They have a fun wedge heel... After church my hubby and oldest decided to try out the hoola hoop, courtesy of our neighbor's daughters toys. It was pretty entertaining...hee hee The new house being built next to us...sigh...it doesn't make us all that happy to have a house so close but we're hopeful that we'll end up with good neighbors and we'll be able to look back on our anxious days of listening to eight hours of hammering fondly. :-) We had some friends over for dinner and this little hunk of sweet love came along! Isn't she the cutest thing in the whole wide world? It makes me crave having more babies...How about her "smile for the camera" face, how cute is that? And my big boy made me so proud last night. 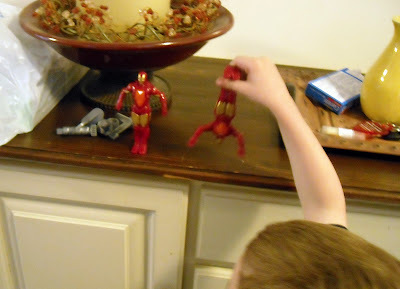 He played with and entertained our friend's daughter the entire time they were at our home. 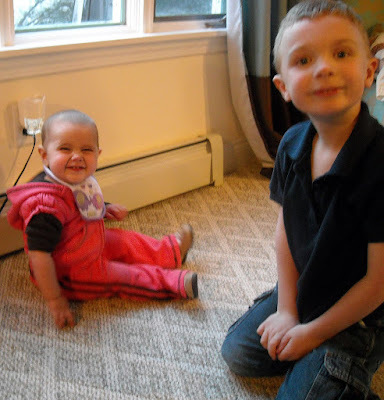 He did all he could to make her giggle, brought her toys, played hide and seek, and patty cake. It was beyond precious to watch...now if he could just treat his little brother as well...humm.... Enjoy!! 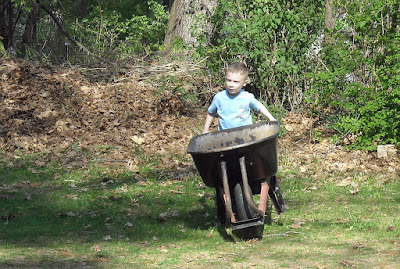 Big boy helper! Boys watching a quick show while Mom cooked dinner. It was me and them alone yesterday as hubby was off with some friends. 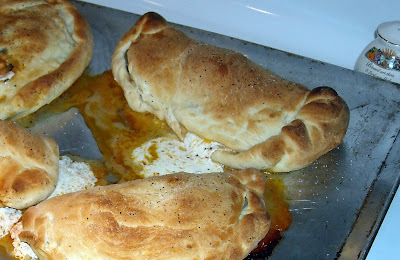 Homemade calzones for dinner! They were really good, even though I totally stink at rolling dough and making an attractive seal...I lost too much cheese! Enjoy! I was lazy about picture taking on Sunday but got a few good ones...be back with those tomorrow! 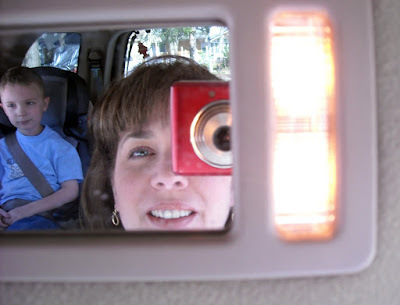 I've been having a grand 'ol time taking lots of photos (close to 100 a day) for my Week in the Life project. I've stumbled upon a few other bloggers out there who are doing the same thing and it's been a blast to see their photos from each day. It's been two days since I've posted my photos and I have so many to choose from! I picked a few of my favorites to share today. We'll start with our lunch journey this week. My hubby works from home so every once in a while we all go out to lunch together. 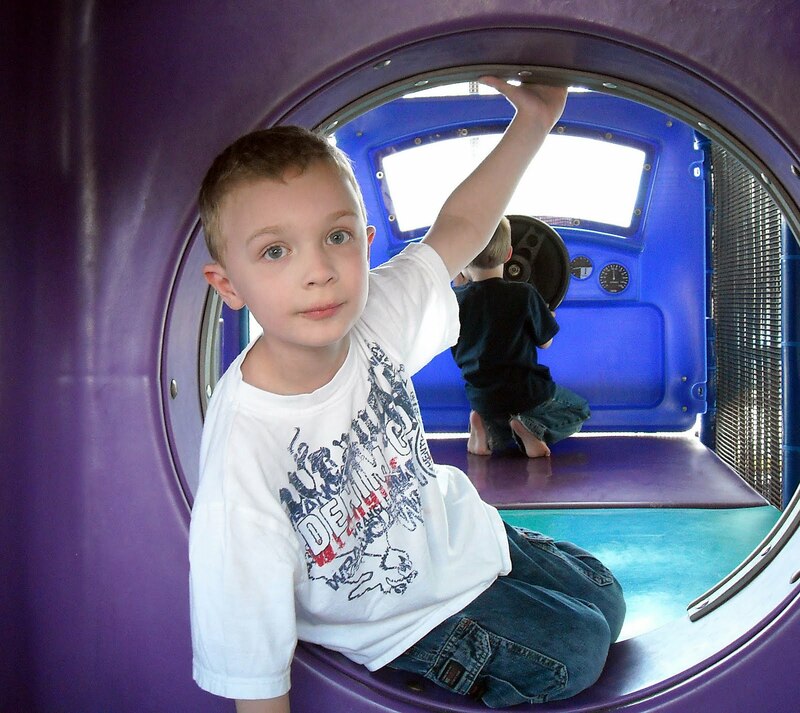 We had some beautiful weather this week and decided it was high time we went to the "playground" Burger King for lunch. (Yes, we indulged in bad for you food...and it was delicious! LOL!) 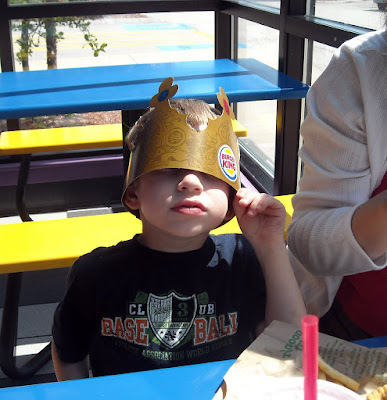 Little C ate with his crown over his eyes because it was "too sunny!" 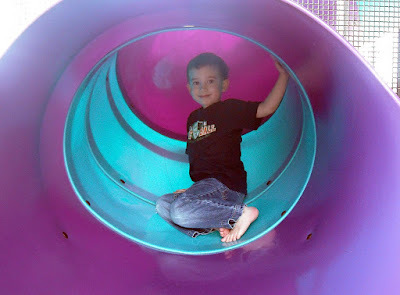 And then it was on to the playground, which is three stories high and full of tubes and slides...very fun! This was a big day for Little C, it was the first time he ventured to the second story and down the slide. This is my huge brainstorm that I came with last night! 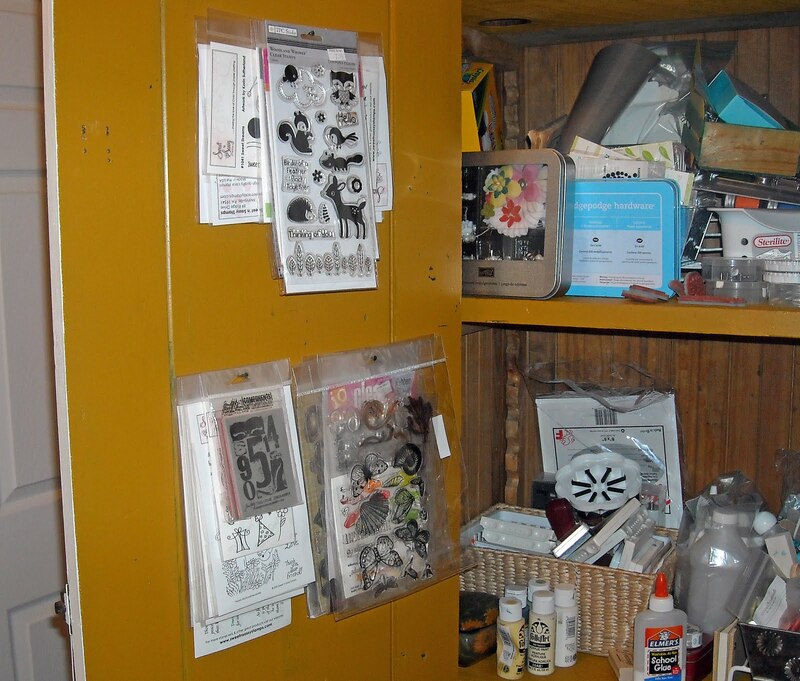 I had all these random acrylic stamps that had no real storage space. I realized they were all in bags that could be hung on a hook, however, I have a tiny craft room and didn't want to clutter up the walls so...I attached small nails to the inside of my giant storage closet and ta-da, instant storage that can't be seen!! I was so excited! And now that I've hung the stamp sets, I'm thinking about what else I can hang on the doors!! 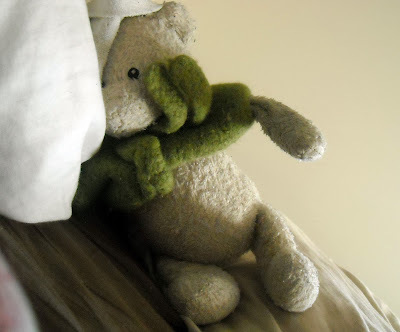 Who I woke up to yesterday morning...This is "Meow", Bean's stuffed teddy, who has been his best buddy for the past five years. He is at the point that Meow stays upstairs during the day and is only snuggled at bedtime. There was a time when he didn't move without Meow firmly held in his hands. 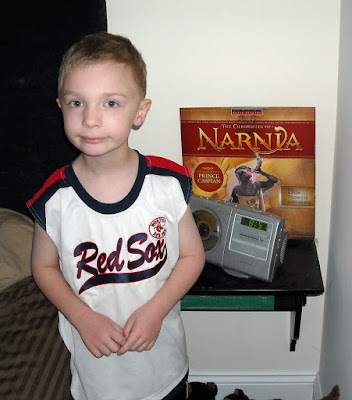 Here's my Beanie-Boy early yesterday morning listening to his Narnia CD's. We found these Barnes & Noble and it includes an audio versio of the entire Narnia series. They are so well done, complete with music and different character voices. We gave him this for his birthday and for the first three days he spent hours just lying on our bed listening to the stories. A fun afternoon spent outside driving the new Lighting McQueen Power Wheels car!! 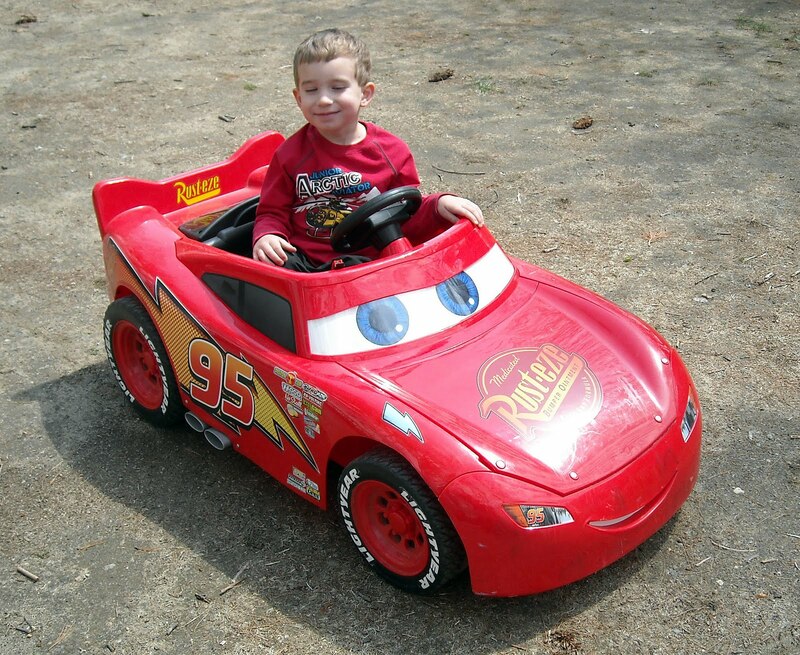 Little C's response to the new car, "I can’t believe we have a real Lightning McQueen.. I’m so happy I could scream!" (My hubby buys and sells custom Power Wheels and parts so he picks these up whenever someone is giving them away...He got this one for a mere $20!) 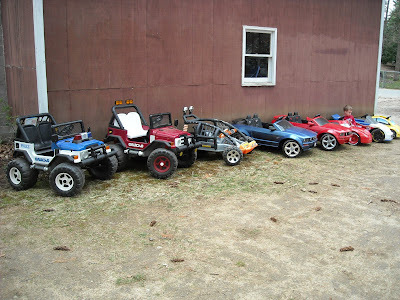 The line up of current Power Wheels in our garage. Most of them will be fixed and sold by the end of the summer but it sure makes for fun play time while they're here! 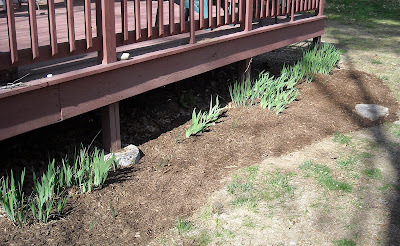 The only downside...it's impossible to grow grass when two little boys are driving all over the yard during the day! 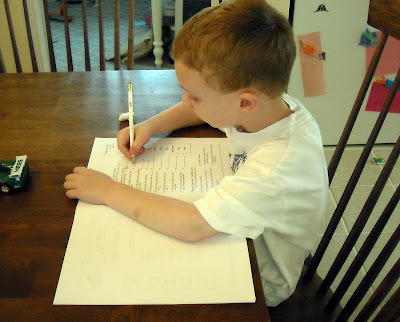 Bean finishing up his third quarter exam...I homeschool so my dining room table is always covered with schoolbooks (and toys)! Dinner ingredients...Last year I subscribed to a Martha Stewart magazine, Everyday Food. I think the subscription cost was $10. for the year and honestly, this is one of the best food magazines I have ever read. The recipes are geared towards busy Moms and one of the magazine's features is a week of menus complete with a shopping list. Almost all of the recipes can be made in about 30 minutes and they taste amazing! Using a recipe, I made my first ever risotto and it rocked!! 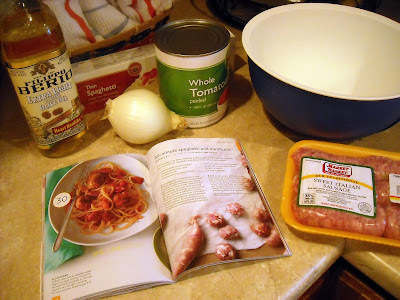 :-) This week we had this quick and easy sausage meatballs and pasta...yummy! We'll use the left over meatballs to make calzones tonight! The boys had their hair cut this week and here is my sweetie boy playing with my camera. He loves to take photos! 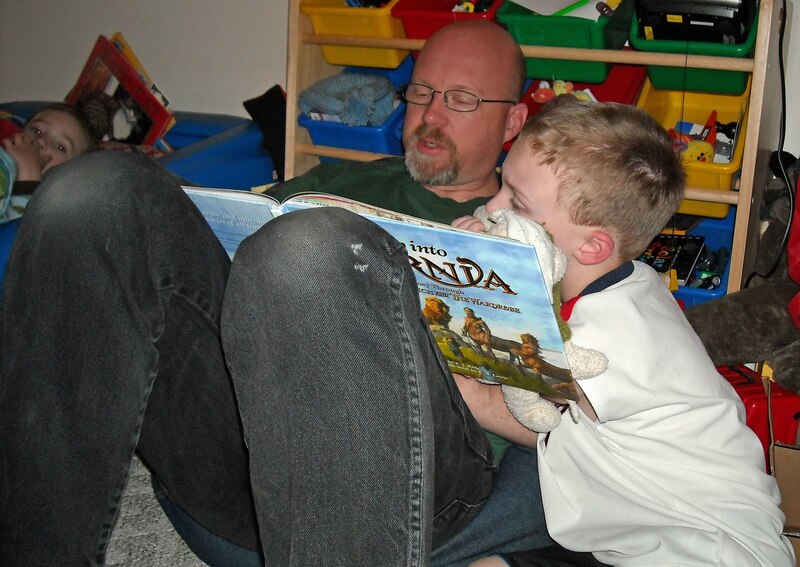 Bedtime story with Dad...Another Narnia book. The Narnia series is absolutely one of Bean's favorites. About two years ago we read all eight books together...It's a great series, something even adults can really enjoy! This is a book I picked up for him when he was sick last week....A super $5. deal at the grocery store! 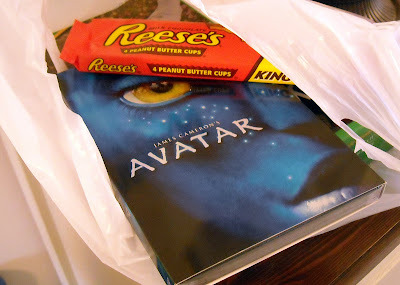 And this was the surprise my hubby picked up for me when he went to the grocery store. WooHoo! We watched it last night...great movie! Enjoy your weekend!! 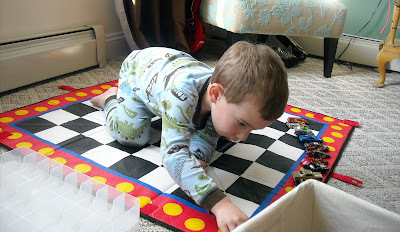 I've been following Ali Edwards for years now...I love to see the pictures of her kids (they're so cute!) and I follow her projects but, well, I'm not a scrapbooker. 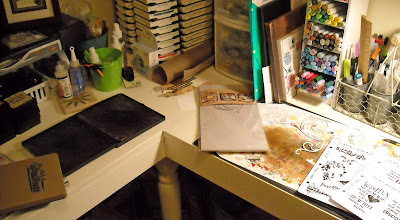 Oh, I've made a few mini books here and there but overall the idea of scrapbooking just plain overwhelms me, although Ali definitely inspires folks to keep it simple...I like that! Ali has been creating Week or Month in the Life for awhile now and while I love seeing what she comes up with and the photos she takes, I've never felt compelled to do the same project for myself....until this week. I was talking with a friend of mine about the difficulties of balancing work, children, taking care of a home...you know, all the things us Moms deal with on a daily basis, and when thinking about these things I was struck by the thought of how quickly time passes, how big the kids are already, and how rarely I ever take photos anymore or write in my journal (something I used to do daily...I haven't written in over a year!) 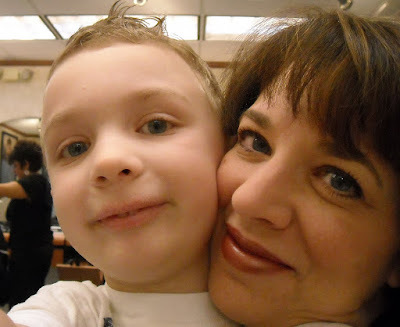 Before I know it, they'll be teenagers and I won't be able to remember the cute things they used to do and the silly things they use to say or how a regular week went. So...I have embarked on a journey to take photos this week and yes, I'm going to create a scrapbook of the photos and I will journal about the week!! I've even purchased my album and some paper (I mean I work at a scrapbook store, how can I not scrapbook!!) Today, since my time in the craft room has been limited this week, I'm going to post some of my favorite photos from the past few days. The one above is of my youngest, passed out cold on our ride home from MA last night. My husband's grandmother passed away a week ago and yesterday was her memorial service. We had a long day driving down to his parents, having dinner with family from near and far (Hi Tanya, it was great to see you!! 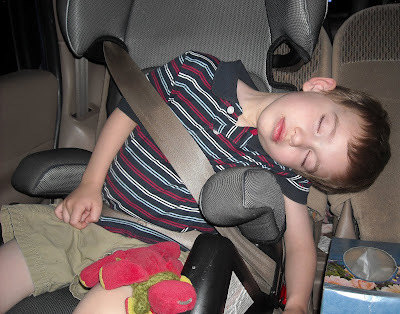 ), and then a long drive home. 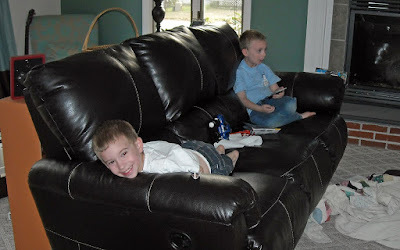 Incredibly, both of my boys were out cold by 8pm...something that never happens! Maybe I should run 'em like crazy every day...Having all that time to myself last night was delightful! 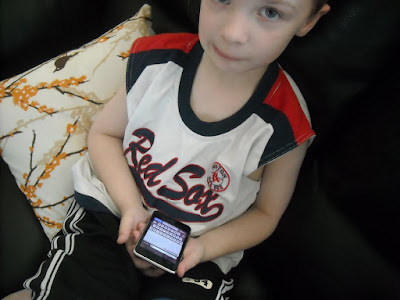 ;-) My oldest with my IPod...he's obsessed with anything electronic (funny, the younger one could care less!). Bean (my oldest, yes, this is what I tend to call him) could proficiently work a PC by the time he was two, including figuring out how to find web sites he had visited by typing in the first letter of the web site URL. He just "gets" computers... Little C "crafting." I adore this face, it's his "I'm a little worried" face. 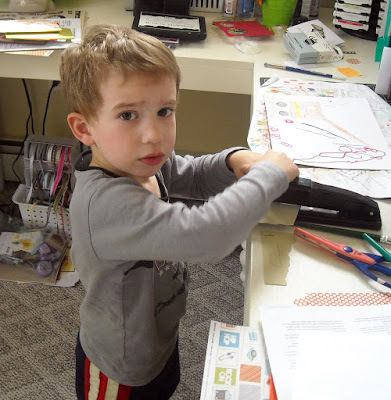 He was trying to work the stapler but he couldn't figure out how to push the stapler all the way down. He's definitely my sensitive, easily worried one and that face makes me want to hug him! 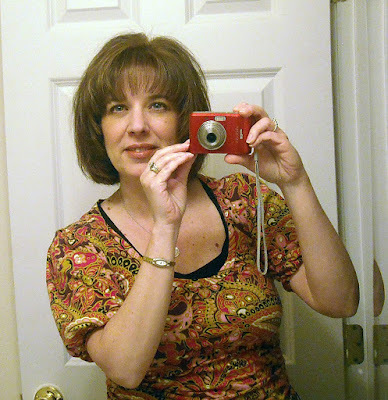 Me with my super short, super light hair cut. (I look like my mother...) It's a little too short but I like the lighter color...This photo makes me think that I need a real camera. 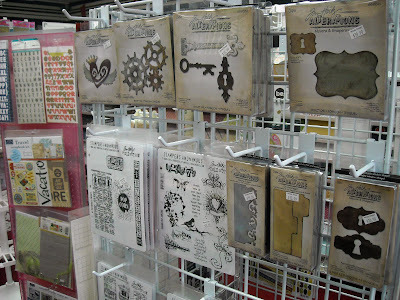 The brand new Tim Holtz display at work..New stamps sets and dies! And I promise, I only bought one die (already bought the stamp sets! 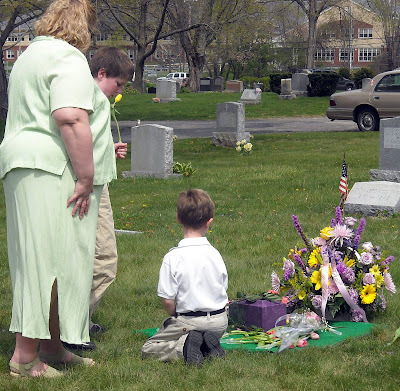 hee hee) The grave site...With my SIL, son, and nephew. It was a lovely service...and a day with spectacular weather. 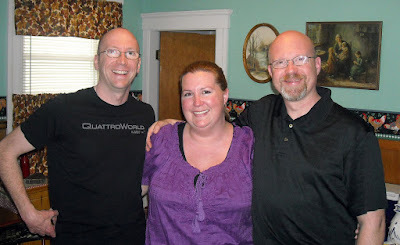 And a great photo of my hubby (on the right) with his brother and sister. (Yes, Mom I'll send these to you!!) 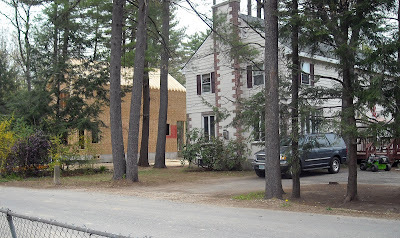 :-) I met my hubby through my now BIL who I worked with at the first job I had when I moved from NY to MA. My BIL and I became friends quickly, he's a sweetie, and I'm sure I became the apple of his eye after spilling a cup of coffee all over my PC. (He was the IT guy...and over the past 11 years he's had to fix many of my PC problems. As a matter of fact the laptop I'm on right now was his. He gave it to me after I ruined yet another hard drive. 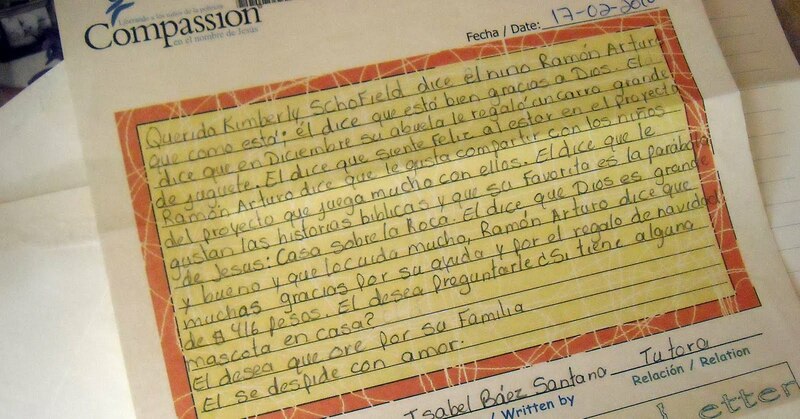 *insert sheepish grin*) My SIL flew in (she lives in another state and is a budding fiction writer...for real!) for the memorial service, surprising my MIL...it was great! 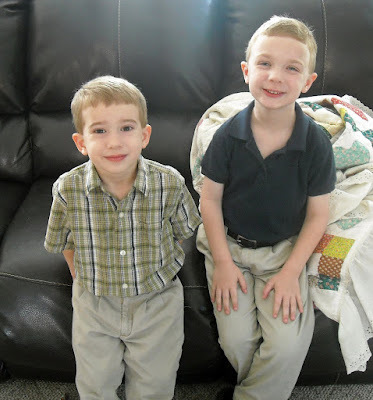 And now I'm off to take more photos and get my kiddies to the hair dresser for their own short summer cut!! Be back tomorrow with something crafty!! 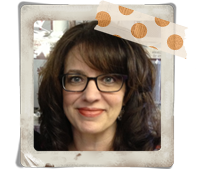 Enjoy and check out Ali's site...maybe consider creating your own Week in the Life. Gnome Home Gnome Sentiments Nathaniel Gnome (of course we named him!) For today's card I started with my sweet gnome house, which was colored with Copic markers. My chocolate brown card base is layered with this fabulous orange polka dot paper from Jillibean Soup along with a sweet woodsey scrap of paper I had hidden in my stash. 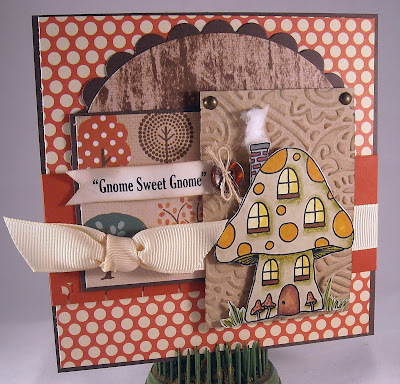 I opted for cutting out my gnome home and then used foam tape to layer it onto a piece of embossed kraft cardstock. To finish off my card, I added some smoke in the chimney but using a piece of cotton, the sentiment, a bow, and a button. And do you know where the layout came from? It's this week's Sweet Stop sketch challenge! This week The Sweet Stop is celebrating its one year anniversary! Check out the challenge details here...You could win 10 free digis!! 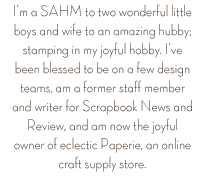 Have I mentioned that we had an amazing time at the Stamping Around event this past weekend, hosted by Wholly Scrap? What a great time spent catching up with old friends, making new ones, and creating during five fantastic classes! A few folks have posted about the event, you can check out the posts here: Cindy Lawrence Julia Aston Donna-Marie (Donna-Marie has a great list of posts about the event!!) Monika Davis Have I told you what fantastic sponsors we have for each event!! We were thrilled to offer prizes from the following companies, Waltzingmouse, Just Rite, Wholly Scrap, Unity, Sweet 'n Sassy, Papertreyink, Bells & Whistles, Taylored Expressions, Our Craft Lounge, My Time Made Easy, and more (forgive me if I missed anyone!!) If you're looking for high quality craft products, please visit our sponsors and show 'em some retail love! And have I told you about our ubber fabulous event suppliers? eclectic Paperie has been a long standing supporter, providing us with extra inks, stamp cleaners, Copic markers, and all kinds of wonderful products for each of our events. And...Gina K generously donates all of the cardstock for the instructors projects! How wonderful is that?? 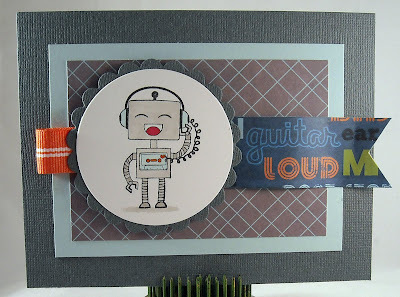 If you've never tried Gina's cardstock, I urge you to purchase your own pack NOW! :-) The quality of the paper is amazing, the colors are vibrant and rich, and cost is spot on. 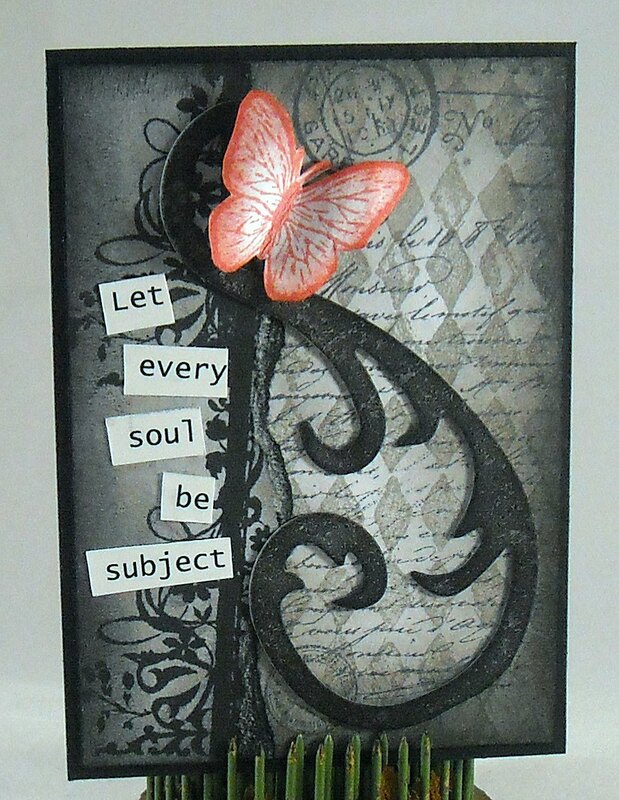 I used her paper to create the punched out butterfly on today's card...Isn't the color divine? 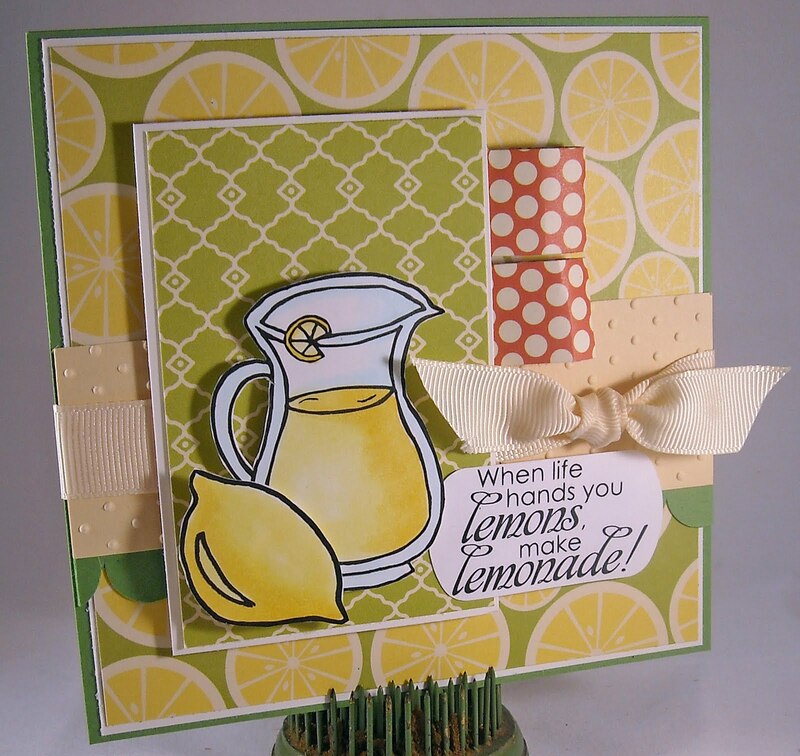 Not only are Gina's papers amazing but her stamp sets are to die for!! I confess that I only have one Gina K set in my collection and I've only used it once...a long time ago. The release this past month contained a number of wonderful sets and I just had to pick up a few! The one on today's card is called A Beautiful Life, isn't it..well...beautiful!! The set contains this amazing floral frame image along with all kinds of words that can be mixed and matched to create custom sentiments. The other set I purchased is Organize It and I have a wonderful little project in mind for this stamp set...Now for the time to create it!! (I have to say that the rubber quality on these stamps is amazing!!) 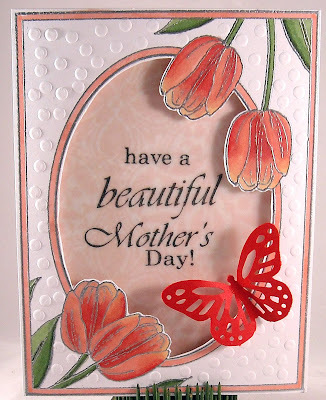 As for the creation of my Mother's Day card...I stamped and embossed the floral frame image. The flowers are colored with Copics. 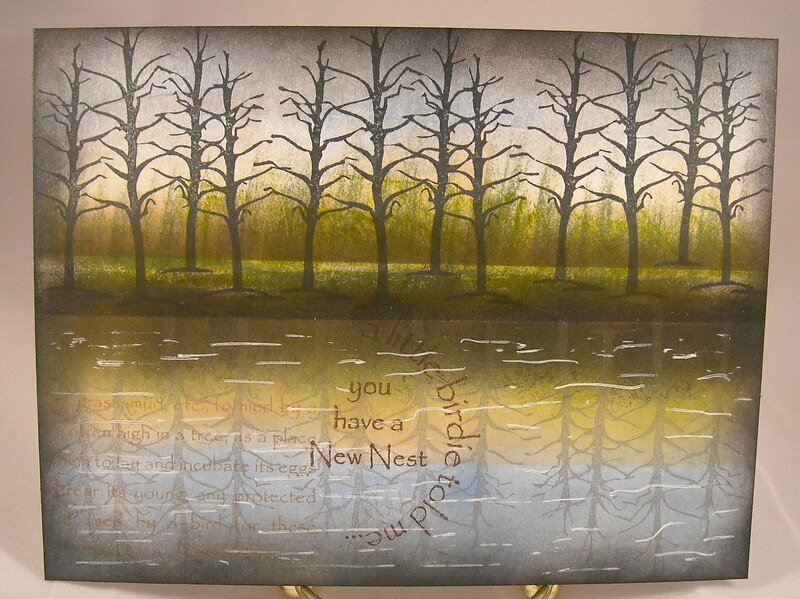 I then used an exacto knife to cut out the inside portion of the frame to make room for my sentiment. And then...I just had to add some design to the outside of the frame but there was no way to run the entire piece through my Cuttlebug without ruining the flowers. The solution? I used the embossing head of my Crop-a-Dile to create little raised polka dots. Fun, huh? 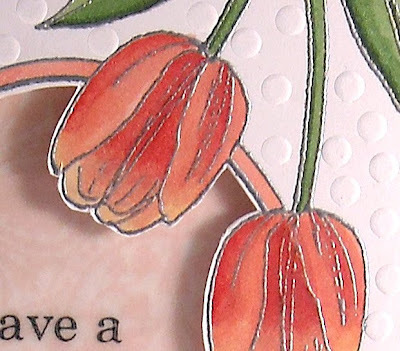 I then stamped my sentiment on a piece of vellum and mounted it onto a piece of DP before using foam tape to attach the piece to the back of the card base. My Martha Stewart butterfly finished off the card! Now head on over to Gina K and our other sponsors and get shopping!! What better way to spend a morning!! :-) And a HUGE thank you to all of our suppliers, sponsors, and teachers who participated in this weekend's stamping event!! Enjoy! Hey, Hey, It's Digi Day! Sweet 'n Sassy Birthday Bash Blog Hop!